Luckyfinds: Get ready for the National Pampering Day 2017! Get ready for the National Pampering Day 2017! Being a mom is not an easy task. Most homemakers are functioning in permanent overdrive to keep homes safe and clean, but continued stress has a detrimental effects on our health. It is important to take "alone time" and pamper oneself to balance life with a hard week. 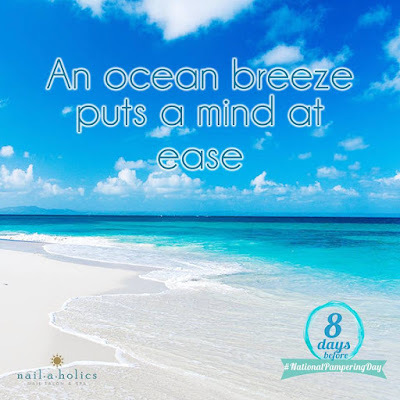 And Nailaholics Nail Salon and Spa is one of the most popular brands which recognizes this need to relax and de-stress. It successfully expanded the pampering campaign into a national level last year and is now on gearing towards its second leg! With the success of last year's National Pampering Day celebration, everyone is now looking forward to the upcoming sequel this October 17th! It is 8 days to go before the much-awaited #NationalPamperingDay and there is no stopping us from getting a FREE SERVICE OF CHOICE: a soothing manicure, calming foot spa or a relaxing foot massage. With this promotion, you get to enjoy the little things in life between 10AM to 12NN at all Nailaholics branches nationwide. You'll be amazed at what a soothing massage and nails grooming service can do. Relax and recharge as trained hands shape and buff your nails, trim your cuticles and pamper your tired hands and feet! This year's National Pampering Day is expected to accommodate more people as the free pampering session will be extended up to 1:00PM! And the best thing about National Pampering Day 2017 is that the campaign is in support of World Vision, The Philippine Animal Welfare Society (PAWS), and Save Philippine Seas---making it a win-win cause for everybody! So mark your calendar, and avail of complimentary stress relieving hand massage or nail care from Nailaholics Nail Salon and Spa branch near you. You deserve it! Do visit www.nailaholics.com to check out more on their services and to find the branch nearest you. Follow their Facebook Page Nailaholics Nail Salon and Spa, Twitter @_nailaholics and Instagram @_nailaholics for get updates and other promotions.